are we looking for, Granddad?" The past two weeks here have been hard to bear with heat and high humidity. I know I may be one of the few who voice a complaint - our winters are long. But, the high humidity causes problems for many and has the weather network constantly offering heat advisories and reminding people to stay inside, keep hydrated and lessen their movement if they must be outside. It is good advice. 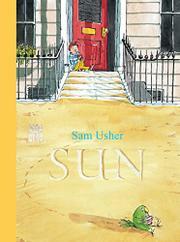 It definitely makes this third in a series of weather books from Sam Usher apt for today. Following Snow (2015) and Rain (2017), today I want to tell you about SUN. It is a very warm read, both figuratively and realistically. It features the same young boy and his ever-patient and congenial Granddad. It's sunny in the early morning. The boy wants an adventure. and hotter than the surface of the sun." After packing their provisions, and making the decision for who would navigate and who would scout, they are off on the day's adventure. Their search for the perfect place to have their picnic is hindered by the intolerable heat from the blazing sun. It beats down on them every step they take. The road is long. Granddad often needs a stop to rest, allowing more time to navigate and decide on their next plan of action. Granddad voices his requirements for the ideal spot as they walk on: picturesque, shade, a cool breeze. Their arrival at darkened cave brings a cool place and a big surprise! Their experience at navigation and looking out holds them in good stead with those who arrived in the cave before they did. A shared picnic also wins them favor. An adventure, indeed, and a boisterous picnic to boot! What more could a grandfather and his beloved grandson ask? Their long journey proves that you never know what you will find unless you keep looking. Look, then look again and again. 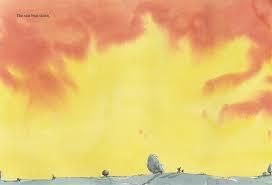 There is a lot to see in the watercolor illustrations that help to tell this story of family love and friendship. Kids will be especially attracted to the double page spread of the many provisions needed to ensure a grand adventure and delicious picnic for two. Checking it out is sure to inspire some stories of their own.